If you use Outlook to manage your contacts, calendar, e-mail, and the like, why not use it for Twitter as well? That's the idea behind TwInbox, a free plug-in that adds a Twitter toolbar to Outlook. From there you just supply your Twitter username and password, and presto: It fetches all the tweets from your account and lets you read them just like you read e-mail. A click of the toolbar is all it takes to send out your own update, send a direct message, reply to a message, or retweet something. TwInbox cleverly auto-shortens long URLs via TinyURL. The toolbar also shows you a preview of new tweets as they arrive, which saves you having to switch to the tweets folder every time you want to check for updates. 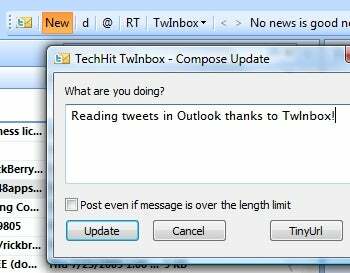 In short, TwInbox is a terrific little tool, and a must-have for any Twitter-loving Outlook users. I do wish it could handle more than one Twitter account, but I can't argue with the price: TwInbox is free.